Located right next to the Magical Garden on the 2500 block of N. Warnock Street, Memorial Park’s lot contained several abandoned row homes for decades. Around the year 2000, one of the row homes was destroyed by fire due to the negligence of a squatter. This led to a quick deterioration of the already weakened structures of the adjacent homes. To ensure the safety of the nearby residents, the City’s License and Inspection Department sent a crew to demolish these dilapidated homes. The north wall of the house that was most heavily damaged by the fire contained the Magical Garden’s tiled mural. 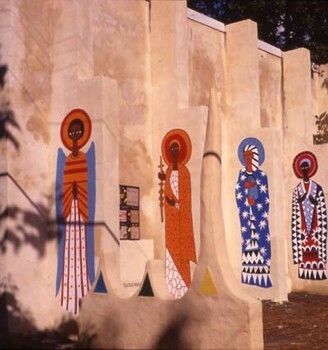 We asked the License and Inspection Department to help us to preserve this wall with the beautiful mural. The City officials responded quickly and generously. 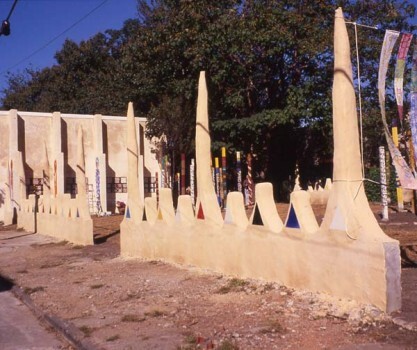 While taking down the row homes, they strengthened the wall by supporting it with several concrete buttresses. 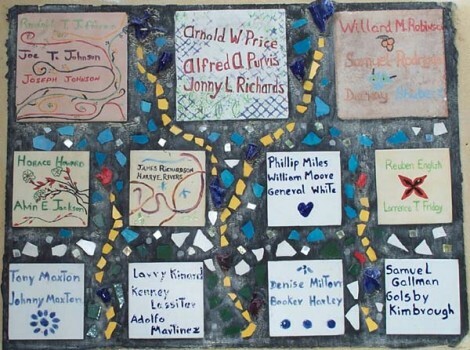 The Village theme in 2003 was “That We Remember.” We discovered that during the height of the Vietnam War in 1963, sixty-four soldiers who graduated from Edison High School in North Philadelphia lost their lives. This marked the highest casualty rate from one school in the whole nation. The building of Memorial Park aims to honor and remember their courage and sacrifice. We also want to honor and remember people from the neighborhood who have died from violence, drugs, and illness. Memorial Park was designed by Lily Yeh and built by The Village construction crew with mosaics by James (Big Man) Maxton. 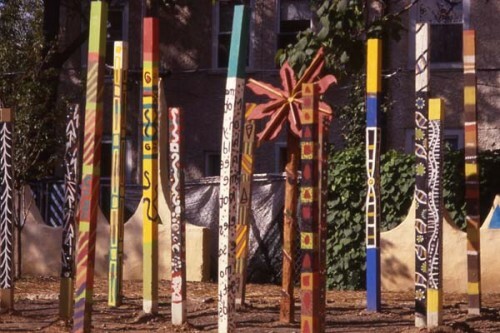 The memorial poles were carved and painted by The Village teens and volunteers wrote the memorial names on tiles. Philadelphia Green helped to landscape the Park.